While pasta is cooking, dice the pepper. When pasta is finished cooking and cool enough to handle, place ¼ lb of Chipped Chopped Ham across length of each noodle. Sprinkle green pepper across ham. Roll pasta, making sure the end is tucked underneath the roll to prevent it from unraveling, and place on a microwave safe dish. 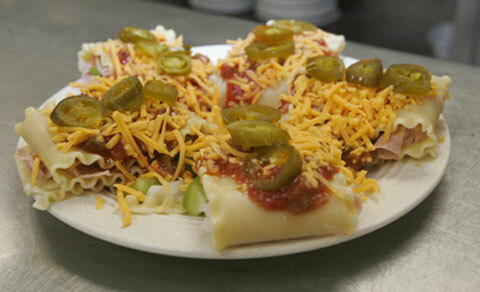 Top rolls with salsa, then cheese, then jalapenos. Microwave until warm and the cheese is melted. Top with sour cream and serve.